The industry’s number one surf kite is back with two new bridle tuning options. One tuning option optimizes performance for offshore wind conditions, and the other optimizes performance for onshore winds. Its standout characteristic, coined “Slack Line Drift”, defines its exceptional ability to drift downwind and stay aloft when the lines are slackened. This has put the Drifter kite at the top of its class. Dominating the podium with 2x World Kitesurfing Wave Championship titles in both the men’s and women’s divisions, it delivers a perfect blend of the best elements of surfing and kitesurfing. The Drifter’s ability to get you up and going with a short depower travel aIlows you to drop in, accelerate, then dump the power completely to snap or carve turns. Its synergistic design allows it to be there when you need it... and get out of the way when you don’t. While surfing it’s sometimes important to depower the kite to the point where you can surf on your own wave generated power without the pull of the kite. It’s here that the Drifter is able to stay aloft and drift downwind with you. When the time calls for it, you can immediately power up the kite and make the next section. A dynamic arc allows the kite to have two distinct arc shapes, one optimized to keep the kite's intended shape while in flight and the other for when the kite is resting on the water waiting to be relaunched. While on the water the dynamic arc opens the span of the kite and orients the wingtips in a position to allow a super quick relaunch. Developed specifically for kitesurfing. Highly durable and low stretch in warp and weft. Excellent recovery on the bias. 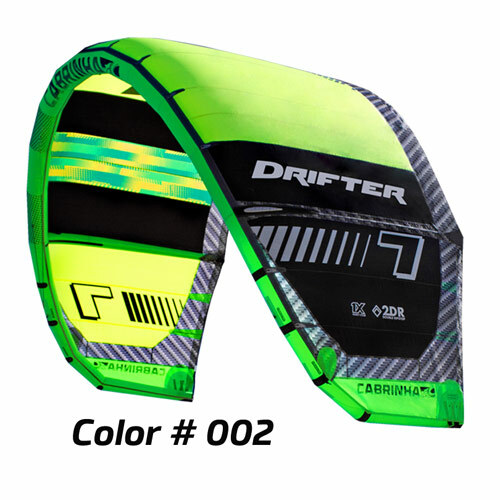 All Cabrinha kites are 100% 2DR Double Ripstop. Allows you to quickly adjust the power level of your kite by the use of each rear line “pig tail” connector. Each rear line has three power positions: the middle being the factory recommended position, the knot closest to the kite giving more power, and the knot furthest from the kite which will give the least amount of power. 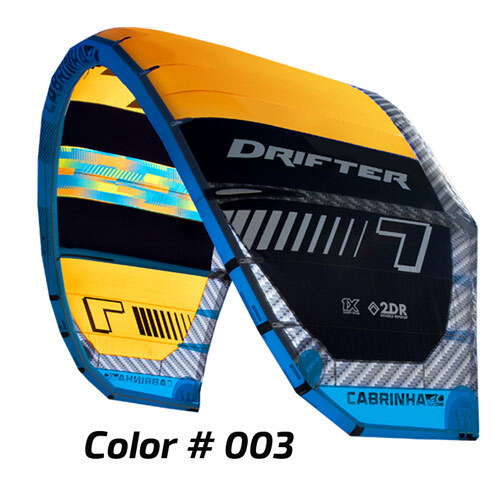 The Sprint Inflation System with Airlock is the fastest and easiest way to pump up your kite. The large one-way Airlock valve quickly feeds air into all of the struts from a single location. The Airlock connection to the Sprint pump now requires no special adapters. When the session is over, the entire kite will deflate in seconds thanks to the Airlock valve’s large dump feature. This season the position of the A & B settings have been updated and completely change the way a kite flies. These options allow you to customize the feedback and bar pressure, adjust where the kite sits in the window, and balance the power/ de-power range of the kite. A = The lightest bar pressure and lightest steering initiation. B = Much more feedback, more bar pressure, shortened depower, and more steering impulse to know where the kite is. 9m best kite I've ever flown. Hands down. Drifter never falls out of the sky, just surfing with a kite. Boom.